Madrid may be lacking in architectural beauty compared with some other major Spanish cities, but it makes up for this with its boundless energy, blue skies, art, culture, and an exhilarating and exhausting nightlife which will delight party animals. The city is compact and easy to navigate on foot; most of the touristic sights of interest are found in the downtown area between the Royal Palace and Parque del Retiro. The capital of Spain since 1562, Madrid sits in the geographic centre of the Iberian Peninsula and has long been an important stop on any art tour through Europe. The famous Museo del Prado on the city's 'Museum Mile' houses important works by Spanish and European masters from the Renaissance onwards, while the Museo Thyssen-Bornemiza houses one of the most extensive private collections in the world. The Museo Nacional Centro de Arte Reina Sofia is devoted to 20th century Spanish art, with works by Miro, Dali and Picasso, and completes the holy trinity of Madrid's art world. Visitors wishing to take a break from all that art may want to see the Plaza de Toros, Spain's largest bullring, where regular bullfights are still held. Sports fanatics who like something a little less blood-thirsty can watch Real Madrid, or Atletico Madrid, two of Spain's most famous football teams, kick off. 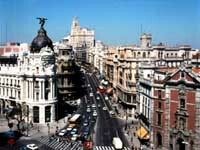 Madrid is also home to some gorgeous plazas and parks which are worth exploring.